I’ll apologise for the crap pictures in advance! As you can see I’ve accumulated a few bits of scrap aswell as a few decent bits and bats. I’ve found that I only wear a handful of them on a regular basis and so a few will be going, although a few of them aren’t worth selling! If you are wondering about the cheap crap Alpha, I bought it to try out as I liked the Planet Ocean but wasn’t sure. Sort of a try before you buy. The ‘Skeleton’ square Bulova was my first auto. 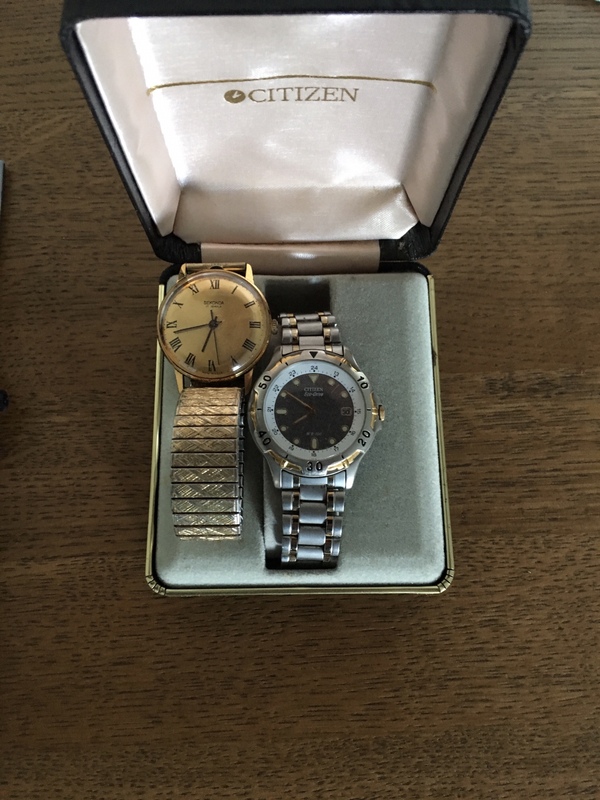 The 2 in the citizen box belonged to both of my grand dads so they just stay in the drawer for sentimental reasons. I’ve bought a few because I like the look of them, but have found I don’t wear them for some reason as they just aren’t ‘me’. Part of the learning process I guess. I’m not too good at providing stories for watches, so here they are. Not as flash as a lot of collections on here, but it’s been a fun few years learning what I actually do like on my wrist. Crap photographs apart, that's quite a clutch of watches you have there. I would be happy to have the Black Bay and Bremont for starters. 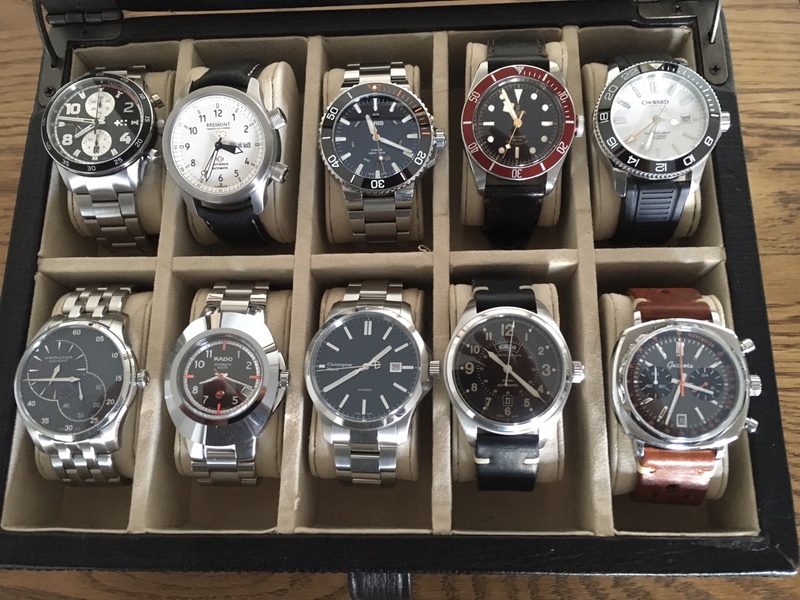 Excellent collection Chris, that top row of your watch box would make a superb collection of five in itself. Where do you seeing it going in the near future, any targets in mind? @cincfleet - the Alpha is decent for the money to be honest and is virtually identical to the Omega visually. Even the bracelet is screws, not pins. Patrick, yes I have a direction I want to go in. Basically, that top row plus the Gekota, Bulova and my grandads watches are keepers (for now). The plan is to get rid of the rest and start a new ‘British Collection’. Things could change, but that’s the immediate future plan. Edit; The GShock is to keep too as it syncs with the atomic clock and is solar, so useful to have. 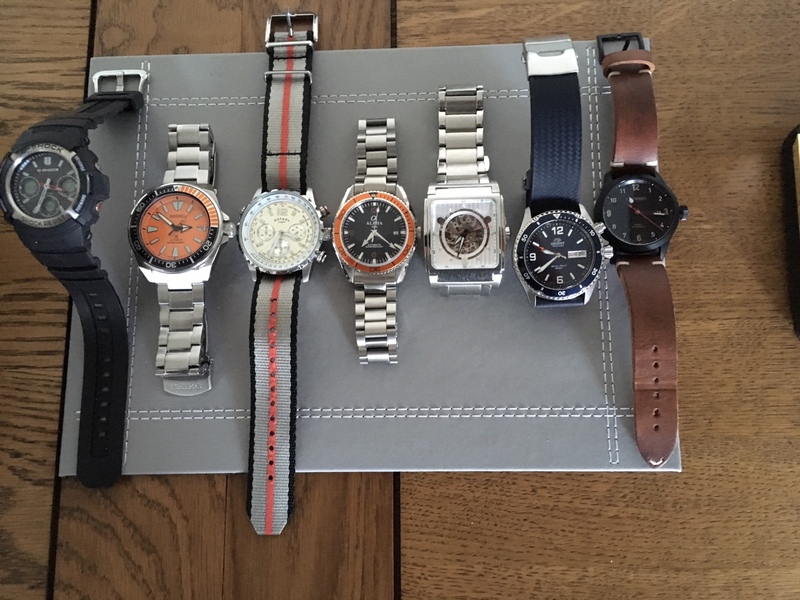 Interesting collection Chris, I like the orange dial Samurai, and a laudable direction you want to go in. We've discussed Elliot Brown, and there is a rare opportunity to pick up something else British in the Sale Corner. Cheers Guy. I need to sell a few before I can start buying again, but I do have my eye on a Farer, a Pinion and a Marloe aswell as the EB. This could get expensive! Lots of good things in there, Chris. That's a really nice varied group. Mate, the top box with the regulator replaced by the orange Seiko will do me nicely. Not that I don’t like the regulator, but reading them does my head in, so I’d have the orange one instead. Cheers Gary. I’m sure you have a box full of Omegas somewhere that I might take off your hands in return The regulator is for the cull, a watch I wanted for a long time, but since I bought it over a year ago I’ve only worn it a handful of times. It’s one of those that I love looking at in the box, but isn’t my style to wear. Too nice to be sat in the box, it deserves to have wrist time from someone who’ll appreciate it. Not bad for a northern bloke. A great varied collection Chris. I like the BB, Bremont and Oris. Great idea to collect British watches - best wishes on your quest.